When asked by Time magazine upon Ingmar Bergman’s death in 2007 what five films he’d recommend to a Bergman neophyte, Woody Allen responded with a list of four movies readily available on disc and The Magician, the as-of-then-unavailable 1958 art house masterwork from the period when nearly all of Bergman’s films were masterworks. Perhaps Woody’s recommendation vaulted The Magician to the top of the surprisingly sizeable queue of Bergman movies that have not yet been released on DVD or Blu-ray. Whatever the case might be, the film has retained its luster, and this new DVD from Criterion Collection is a must-have for foreign film fanatics. Usually the most naturalistic of performers in Bergman’s films, Max von Sydow (Robin Hood) plays here a cipher, a 19th century mute magician who confronts, and bests, a group of non-believers out to prove that his act is a sham. Although his character is “under wraps” for most of the film, von Sydow has a quiet, simmering power in the role, which is explained in the special features included on the DVD to be Bergman’s depiction of the artist’s struggle against his critics. 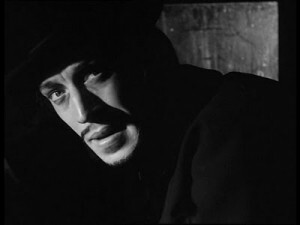 Critic Peter Cowie, in an on-screen dissection of the film, says The Magician was Bergman’s “act of revenge on critics,” especially those who had trashed the filmmaker’s stage work in Malmö, Sweden. Additional special features on the DVD spell out what Bergman thought of the film. A snippet from Swedish TV finds him deftly talking around the movie by telling an anecdote about a Chinese wood carver. And an audio interview by filmmaker Olivier Assayas and Stig Björkman includes Bergman’s comments that it is “a funny picture,” amended slightly by Assayas’ polite comment that it does have its share of serious moments.